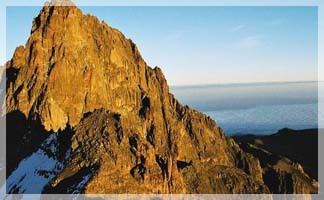 Mount Kenya trek that combines the two most scenic routes of Mt Kenya. Ascent is on the dry side of mountain which offers some of the finest walking. Climb up through forest into a wide ridge approach to the summit area. 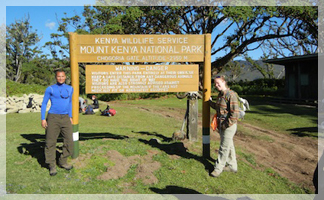 The route starts on the northwest side of the mountain near Nanyuki. Access is adequate and the bunk house facilities are the best on this side of the mountain. Leave Nairobi at 8 am to Nanyuki town for lunch, taking about 4 hours. Proceed to Sirimon Gate, 1 hr, 2440m. From the gate follow the track as it winds uphill though the forest which becomes heath land after about 3 hrs. About 3½ hours from the gate the track veers right to Judmier Camp, 3300m for dinner and overnight. Descend 2hr, 15km to forest clearance to catch a 4x4 transfer vehicle to Chogoria Village where you will connect with your transfer vehicle back to Nairobi. This is one of the most straightforward routes. 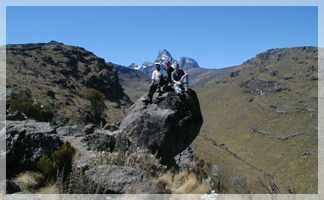 You will enjoy trekking this route as you listen to stillness of this park. The spectacular sceneries lay before you while chirping of the birds and other creatures fills the air with the sounds of African wilds. 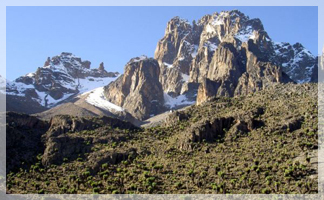 After breakfast, depart Nairobi for Naro Moru town where you will spend the night at the Youth Hostel after sorting out and organizing any gear you may require to hike up the mountain, which also serves as an acclimatization process as Naro Moru is 2,000m above sea level. Drive to the Naro Moru Park Gate and hike a distance of 9 km in an average hiking time of 4 hours. Rest of the day at leisure continuing with the gradual process of acclimatization. Dinner and overnight at the hut, which is 3,000m above sea level. After breakfast we ascend the Sirimon Track to Liki North Valley and spend the night camped in this beautiful little valley below subsidiary peaks of Teleki and Sendeyo, two ancient parasitic vents of the main peaks. 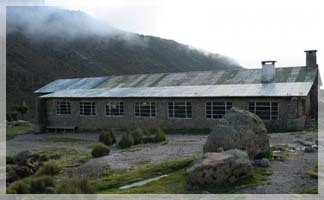 Overnight stay in Liki North Valley,13,000 ft.
Atempt Point Lenana at 02:30hrs and be at the peak before the sunrise. After the sunrise, descend the mountain to Mintos hut for a full breakfast. After breakfast descend with lunch enroute to Chogoria Bandas campsite for dinner and overnight. After breakfast, descend the mountain and connect with your transfer vehicle to Chogoria town for lunch. After lunch drive on to Nairobi with arrival in the late afternoon. After breakfast vehicle transfer to Sirimon park gate start your 5 hours hike to Old Moses camp for overnight (3300m), (5 to 6 hrs hike) where you pass through a tropical rain forest and bamboo forest. All meals and overnight at the campsite. After breakfast hike to Shipton’s camp (4200m) for overnight (5 to 6 hrs hike) The walk takes you near to the summit. Shipton's camp has also an excellent setting with the north faces of Nelion peak and Batian peak facing it which provides a very beautiful scenery dinner and overnight at the shiptons camp. Day 4: Shiptons-Point Lenana-Mintos Hut. 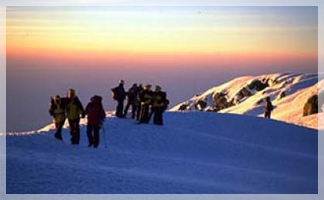 Wake up early at 2.30 am attempt on Point Lenana (4985m) A pre-dawn attempt on point Lenana gives you enough time to reach the summit when the sun is rising and in clear weather which gives you a clear scenery. Afterwards descend to Mintos hut for overnight. 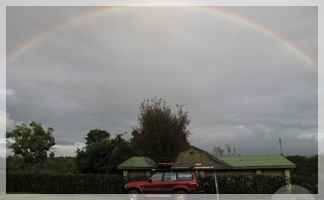 Descend leisurely to Chogoria park gate (3020m) for overnight. This area has spectacular views down into the Gorges valley with Lake Michaelson and Vivienne falls, and across on the other side you can see Ithanguni peak, Rotundu peaks and the Giant Flat -- top Kilingo hill table. After breakfast descend leisurely to Chogoria town for transfer back to Nairobi. Chogoria gate to Chogoria town is about 3 - 4 hours, on dirt roads through a thick bamboo forest and tropical forest. The forest is really beautiful with chances of seeing wildlife such as, white-tailed mongoose, elephant, black rhino, Columbus monkeys, Suni, duiker.